Let’s talk about your chord playing and about your chord vocabulary. But , before we start, what are chords? A better answer, for our needs, than the basic definition of a chord as a set of (at least) three notes played together, would be to think of chords more as a suggestion, a code, an invitation to explore and create various sounds. If you play accompaniment for a song using the same few shapes in the same places on your fingerboard every time, then this article is for you. I would like to invite you to expand your chord vocabulary and explore different sounds, making your accompaniment playing more interesting. What do you have in mind when reading the chord “G”? How many shapes do you think of? A lot of us play one or two shapes all the time. But you have so many options! Why be satisfied with two? Major chords: Chords you can play for all the major chords (tonic or subdominant major chords) which don’t function as Dom7. Dom7 chords: Chords you can play for major Dom7 chords in no matter what function they play in songs. Dom7 chords: D7, F#7, G7, E7, A7. Mastering the form of the song. Having the option to choose your preferred colors at any moment, according to the way your soloist is playing. 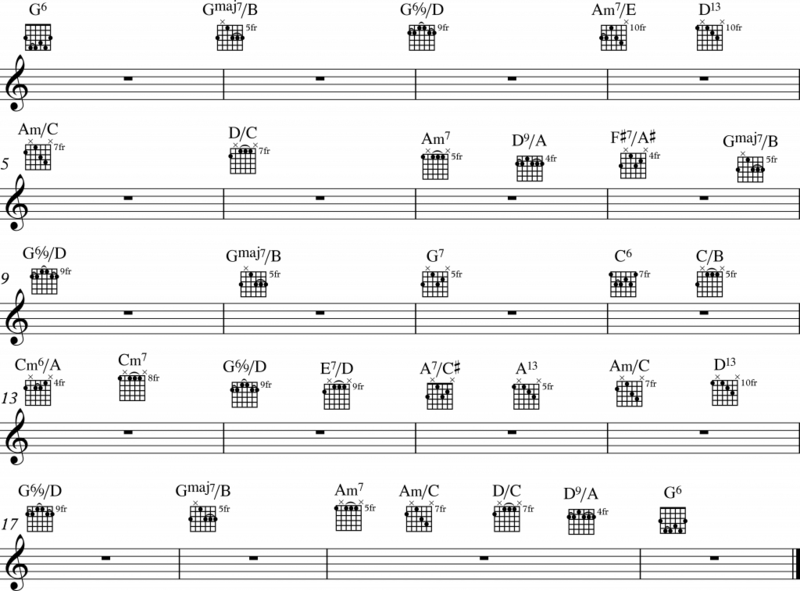 Knowing chord theory is very important if you want to expand your chord vocabulary further on. With this knowledge, you can change each chord, add colors and explore this magical world by yourself. Stay tuned for my book about chord theory – I’m working on it now. Follow this link to get your FREE Gypsy and Jazz Chord Book! So beatuifully presented. I will learn muck from your demo. Most of what you have shown, I already know and understand. I didn’t see the way you have combined the chords for myself, nor do I have enough fluency to master it in one study, but your help is very much appreciated and I will love to devote some time to it. Thank you. I will learn much from your demo. You are such a good teacher, you know the true art of pedagogy! Thanks Yaakov for free book. There are many types of G chords. Lots of them have technical attributes which defines what type of G chord it is eg G dom7 etc. As of now I don’t understand this or why this or how this. In the future I will know. But slowly because there is a mountain of guitar/ music theory on the Internet. Each slightly different and requires different ways of learning it so that it’s more organic to MY brain. I will soon release a new e-Book that packs all the information needed about chord theory in one place. Nothing better than finding a new lesson from you in the morning! Beautiful song, my left hand can grab most of the shapes but my mind and right hand are lagging behind, la pompe still eluding me,too many years of learning finger style arrangements from tabs. Thanks for the great lesson! Thanks from the mountains of British Columbia., Canada. As these chord shapes presently make more sense to my mind than to my fingers it’s only a matter of spending a few zillion hours to train fingers and then, boom, I’ve got it. Always so helpful to see you play these with such facility. Love your style. I am elated that I ran across your vids/lessons. Wish I could have known this 35yrs. ago. I spent all that time trying to read classical music by sheet music and always had trouble reading and finding notes on the fret board, so I just gave up. About a year ago, a friend mentioned pentatonic scales, which I never knew existed, and it made all the difference in the world, although, it made me mad that I had wasted all those years. Oh, well. cest la vie. Now, I practice every day. I’ve learned more in one year than the last 45. It’s still a long journey, but I’m retired and have the time. Thank you senior Hoter. Keep up the good work. You’re an amazing musician. Thanks Yaakov. I always enjoy your lessons, Things that seemed complicated become so straight forward. You’r a real inspiration. What’s up, just wanted to mention, I enjoyed this article. It was practical. Keep on posting! Sounds like a good plan Phil! Be consistent and you’ll have it.